Brussel sprouts are the smallest of the Brassica family (others include broccoli, cabbage, and cauliflower). This homely vegetable only likes to make an appearance this time of year so it is best that cooks take advantage of this very seasonal vegetable. When I am eating brussel sprouts raw, I prefer them to be shaved. That being said, if you like a meatier bite, feel free to cube the sprouts instead. This salad is served up with bacon (a natural pairing with brussel sprouts), corn, goat cheese, and more. Each bite is packed with flavor. Line two baking sheets with foil and lay the bacon strips flat, making sure pieces do not overlap. Bake for 15 to 20 minutes, until crisp and golden brown. Transfer the cooked strips to a paper towel to drain the excess fat. 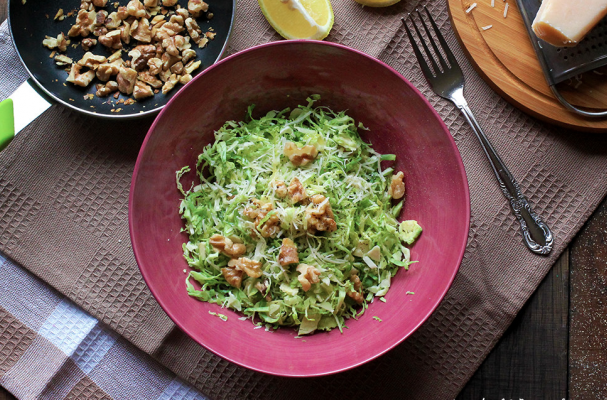 Meanwhile, using a food processor or mandoline slicer, shred the brussel sprouts. Divide the brussel sprouts into four bowls and add some bacon, cranberries, corn, goat cheese, croutons, and walnuts in each bowl. Serve the desired dressing on the side. Mix sugar, salt, mustard and vinegar. Add shallot juice and stir thoroughly. Slowly add oil, beating constantly, until completely combined and thick. Add poppy seeds and beat for a few minutes. Refrigerate.